Epicenters like San Francisco’s Haight-Ashbury and New York’s East Village are well established in the lore of fervent counterculture. Despite popular consensus, Houston, Texas, held its own as a locus of bohemian life and political activism from the late 1950s through the early 1970s. Faced with a brutal police force and a roster of reactionary Klansmen, Houston’s alternative press railed against injustice in all its forms. Apropos of its mission, SPACE CITY NEWS (later SPACE CITY!) displayed Pancho Villa on the cover of its first issue, which debuted on the Mexican revolutionary general’s birthday, June 5, in 1969. Born in 1955, Henry Weissborn was 14 when SPACE CITY! first appeared on newsstands. The paper was published by members of the Students for a Democratic Society (SDS) and a coalition of other radical youth groups active in Houston and Austin at the time. In addition, the Youth International Party (YIP or Yippies), fronted by Abbie Hoffman, Jerry Rubin, Ed Sanders, and Paul Krassner, was formed in December 1966. All of these forces, combined with radical movements around the world, would shape Weissborn’s political identity throughout his life. SPACE CITY! was an outlet for the counterculture in Houston. Anti-war, anti-police state, and pro-civil rights perspectives earned many of the newspaper’s staff death threats, police intimidation, and even bomb scares. By the mid-1970s, concerted efforts of police intervention, commercial redevelopment, and the general lack of cultural expression would stifle Houston’s underground. Weissborn became aware of the Yippie movement in his early exposure to SPACE CITY!. Central to the cause, the Youth International Party tied the Hippie movement of the late 1960s to the New Left, and the high point of its activity occurred at the 1968 Democratic National Convention in Chicago. By the mid-1970s, the issues had changed. By 1976, the end of the draft and the Vietnam War had quieted much of the angst from the preceding movement. The most aggressive activists had either been imprisoned, voluntarily exiled, or were living under assumed identities. National countercultural icons were maintaining a voice in academic circles through literary writings and speeches. Musically, the world had changed. Acid/Psych Rock evolved into Prog, and the airwaves were co-opted by Disco. Top 40 music killed the experimental edge that had emerged a decade before. Primary Yippie activity revolved around marijuana legalization, although widespread hysteria surrounding its usage had waned. A dozen pot-smoking Yipsters were ignored at the 1976 Republican National Convention in Kansas City. In April 1977, the Youth International Party’s 10th anniversary “Be-In” was held in New York City’s Central Park with a turn out of only 200 members compared to 10,000 in 1967. Despite the drop in numbers, the Yippies were finding new avenues of protest in the late 1970s. “The Yippies are the only truly authentic New Left group that has survived,” Weissborn said in a Dec. 6, 1978, interview with THE DAILY COUGAR, the University of Houston’s student-run paper. The core of the movement was rooted in action and not ideology, Weissborn underscored, and its strength lie in influence and not numbers. UH’s Yippie Chapter comprised only three members — Weissborn and brothers Jeff and Dave Stewart. Texas Tech University in Lubbock had the only other Yippie faction in the state. At the time of the interview, Weissborn was President of UH’s Direct Action Committee and a self-proclaimed Yippie leader. A major issue of concern in 1978 was the anti-nuclear movement. The Yippies along with other activists, including Jimmy Bryan, helped organize the Mockingbird Alliance, which was Houston’s first anti-nuclear protest group. In October 1978, the group held an “Anti-Nuclear Tribal Stop,” which Weissborn described as a five-hour music festival of life. Attendance was a challenge for many of these early events. A “Be-In” held at Houston’s Lynn Eusan Park in November of that same year drew a crowd just above 500. This event was marked by early appearances of some of Houston’s first punk bands and featured a speech by Aron Kay “Pie Man,” the Yipster known for throwing pies in the face of Howard Hunt and G. Gordon Liddy among others. “The ‘Be-In’ signaled a new wave of protest in the Gulf Coast region,” Weissborn told THE DAILY COUGAR. Other social issues central to the Yippie cause included the Equal Rights Amendment, gay rights, government spying, and racism. 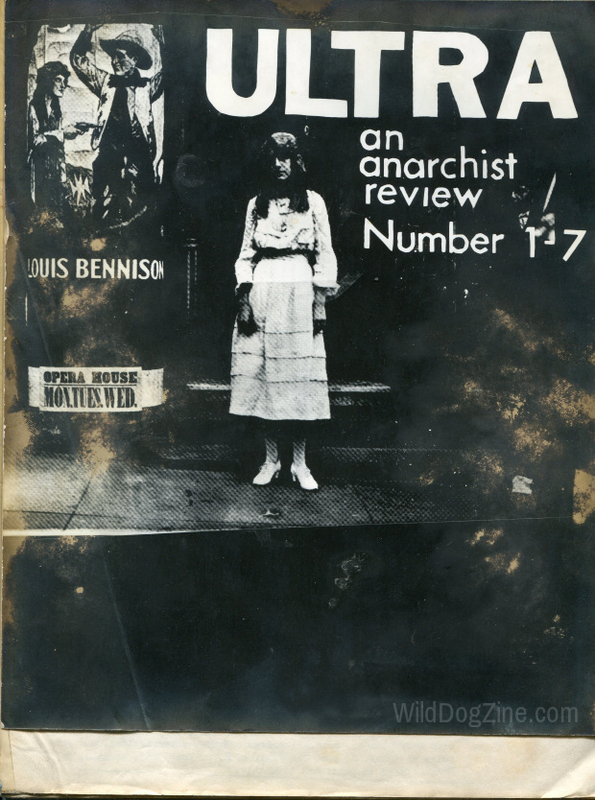 To chronicle what actions were being taken around the country and internationally on these issues, Weissborn founded ULTRA, the official underground zine for UH’s DAC. Weissborn debuted this first iteration of his DIY magazines in April 1978 and published the fourth and last issue of ULTRA in January 1979. Coverage ranged from local dope prices to national news on labor movements and hunger strikers across the Atlantic. It is difficult to surmise how much influence ULTRA may have had on the Houston populace and UH student body. The zine stands out as a not-so-common artifact of social protest during an otherwise stagnant era in Houston. In THE DAILY COUGAR interview, Weissborn announced plans in the making for a Rock Against Racism rally, to be held April 1979. The event would prove transformative for Weissborn. Abandoning his Yipster identity and long hair, Henry “Wild Dog” entered the scene.